Sometimes a product becomes such a staple for me that the thought of reviewing it sort of just disappears into the back of my brain, you know what I mean? 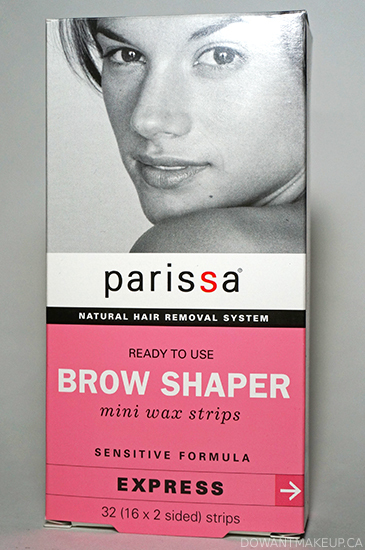 Products like Parissa's Brow Shaper mini wax strips just become a regular part of my routine and the shinier stuff that I've acquired more recently becomes the focus of my attention. Plus it's wax strips, not exactly the most exciting product out there. But guess what? They are totally awesome. Because my hair is naturally very fine, I have tons of brow hair that is difficult and time-consuming to grab and pluck with tweezers. Having toyed (unsuccessfully/painfully) with heating wax and applying it to my legs with a stick in the past, I had decided to try a ready-to-use variety. There are a total of 32 0.5cm x 2.5cm (0.25" x 1") strips in a box, plus a vial of azulene oil to remove left-behind wax, soothe skin, and (supposedly) prevent ingrown hair. Each strip you see is actually two strips fused together; once you peel a strip apart to use one, you kind of have to use the other. I totally lucked out that the first product I picked up happened to work great for me. The wax strips grab every superfine hair and remove them quickly and easily, leaving my brows looking clean and polished. There's always an errant hair or two missed that I need to pluck out, but it's infinitely easier than standing at my mirror for what feels like 60 years picking at every tiny hair. It doesn't irritate my skin or even hurt to remove the strip, so the "Sensitive Formula" definitely works on me. I've also used them to wax away all of bf's stray brow hairs (don't tell him I told), so I know it works on thicker hair too. 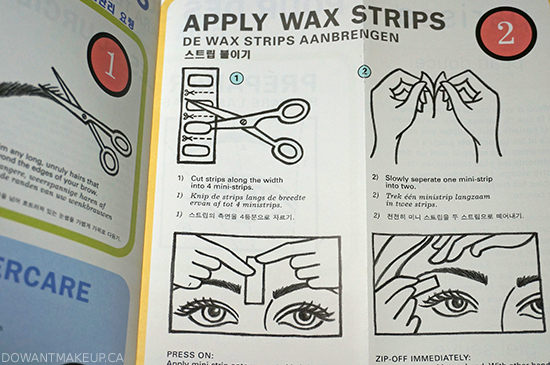 Included: a huge multi-language foldout with instructions and tips! Typically I use them after a shower, when the warmth has made my brow hairs easier to remove. Then it's as simple as cutting them up, peeling a strip apart, applying, and quickly pulling it off. Easy! Afterwards, I dip a cotton swab in the azulene oil to quickly remove any stickiness left behind by the wax. 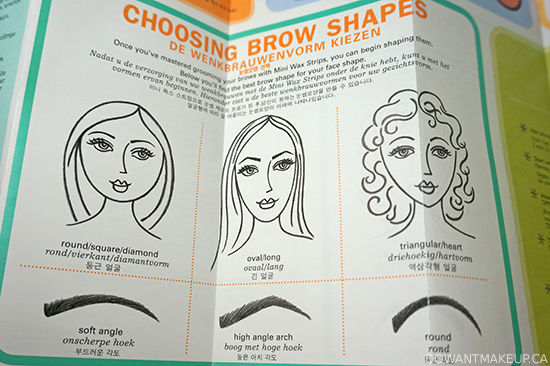 However, due to their rectangular shape and relatively small size, they may not the be best option for people with a very rounded brow shape, or for people who need to remove a whole lot of hair in terms of surface area. 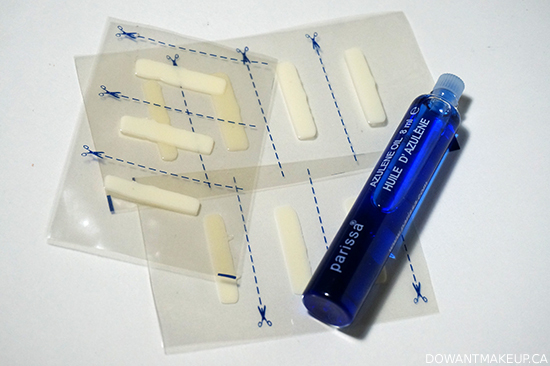 I do wish the vial of azulene oil was sold separately: I'm on my third box of these strips, but still using my first vial. The oil works great, but it's an unnecessary cost to add to every box, which retails for about $9 in drugstores. More affordable than going to an esthetician but not exactly cheap, so I wait for a sale unless I'm totally out and having a bad brow situation. Definitely recommend if you are looking for a simple, at-home alternative to tweezing! How do you maintain your lovely brows?